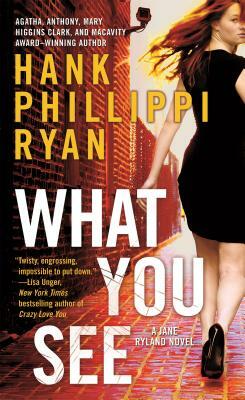 What You See: another thrilling installment in Hank Phillippi Ryan's award-winning Jane Ryland mystery series. Why would a father abduct his own child? A wedding is planned in Jane Ryland's family, but there's a disaster instead. Nine-year-old Gracie-supposed to be the flower girl-has been taken by her stepdad. Where are they? Is the girl in danger? Reporter Jane Ryland learns there's a limit to the bonds of family-and learns to her peril what happens when loved ones are pushed too far.